Great guide! Highly recommend Doug! He is extremely knowledgeable in local culture , history and geology. We had a wonderful experience and now have a greater appreciation and understanding of New Zealand. We feel blessed that we found him! Doug is an extraordinary guide. His knowledge of Maori culture is amazing and first hand, given that he was raised in a Maoria school and community. Also, he is super well informed about virtually all aspects of NZ culture, ecology, government, etc. He is very bright, articulate, and has the heart of a teacher. He's the best guide I've had in some 50 years of travel. This was my first time using ToursByLocals....I hit the jackpot with Doug. He was informative, interesting, knowledgeable, funny....well Doug's performance was beyond my expectation. My wife and I took a ship tour today, and all I say to my wife was , "this sure is not like the tour we enjoyed with Doug". He has set the bar high, but hold hope that ToursByLocals will be the manner we use when traveling and touring in the future. Thank you Doug! Thank you ToursByLocals! Doug met us in Tauranga and we spent the day working our way toward Hamilton where we would board NZ Rail for our trip to Wellington. Although the focus of the trip was birding, Doug's unique environmental background, and his crusade to share that expertise with college youth from around the world, provided an in depth look into New Zealand's effort to protect its beautiful and unique natural treasures. As environmental and political activists, we were truly inspired to continue our crusade in the US. Doug was fantastic and accommodated our group of 18. He was very personable and I really enjoyed the stories he shared about is beautiful country! Doug was one of the best guides we ever had and we have traveled the world using private tours. His knowledge and understanding of the land and people still amazes me. I still talk about his amazing ability to put life in his small part of the world into perspective. Thia was our second day with Doug. His knowledge makes traveling with him a unique and wonderful time! After exploreing the beauty of the area, the additional materials and information he provides about Hobbiton serves to enhance the experience. We strongly spending as much time as possible with Doug! we were on the cruise a lot and every tour guide we found all meet our expectations, Doug was one of them, during the tour, he explained every interesting thing and place in detail, treat us with passion and care, we are not only remembered what we experienced but also remembers Doug as a great guy, more than 5 stars service. Doug is wonderful person and guide! His knowledge and ability to understand our likes and interest was outstanding. The conversations during our time together were highly intelligent providing for a deep appreciation of New Zealand and the respect its people have for this unique land. By the end of our two days together, we felt like we had spent them with a good friend. We would highly recommended Doug to anyone! Doug was a fantastic guide. I traveled with a handicapped person and Doug accommodated her every need. Doug was very knowledgable and provided the best historical and cultural commentary. He also provided interesting information on wildlife and nature. Doug was courteous and personable. I highly recommend his services. The guide Doug gave us a perfect tour in spite of the bad weather. The tour bus was comfortable and Doug was very effective in describing all the tour points. He provided immediate feedback to my emails and customized a flexible itinerary for us, a group of 16. Doug gave us a perfect tour in spite of the bad weather. The tour bus was comfortable and Doug was very effective in describing all the tour points. He provided fast feedback to my emails and customized a interesting and flexible itinerary for us, a group of 16. Over the top great tour! Doug arranged a private tour of the Hobbiton movie set for us early and we had the place practically to ourselves! If you are a LOTR fan you will love this. Magical, nestled into rolling hills, and you expect to bump into Bilbo Baggins any minute. Next was the Waitomo Glow Worm caves, touristy but also awesome. Last a preserve where we saw a Kiwi bird (who thought it was night) foraging about. Also, Doug entertained and educated us on all aspects of NZ along the way. Fascinating! This is the best way to see these amazing sights. We were on a cruise around New Zealand and had a choice between the cruise line's shore excursion or booking with Tours by Locals - I can't express how happy we are we went with Doug. Folks who took the shore excursion were rushed through because the bus was delayed in traffic. We hit some traffic too but Doug called ahead to rearrange the schedule so we had no problems. He's a great person, really knows the area and the sites as well as the guides do. This was a personalized tour, and it was simply fantastic!!! Doug is unbelievably knowledgeable about the Maori culture, NZ's environment, the geology, biology, and hydrology -- everything that I wanted to know about. I feel like I know more about and understand NZ better after my one-day tour than I could have in months of living there. Even though the tour was really in depth, it never felt rushed. We got to do everything on my must do list and a whole lot more. Doug -- I can't thank you enough! Our Ship broke down in Napier, which delayed our arrival in Tauranga, and the tour had to be shortened. The Maori Chief Ceremony was outstanding and really made the whole trip. Doug saw to it that our friend was the "Visiting Chief", and we recorded the Ceremony in it's entirety. It has been the one thing out of the entire 42 day trip that was completely memorable. If you get chance to do this trip, this a is MUST do. Doug is knowledgeable in the Maori Culture and Customs, and history of the area. Excellent tour guide. Met us promptly at the dock and then completed a long, but very informative day. Gave us choices of touring options and times involved, but then made sure we were back to the ship on time. I would recommend Doug to anyone who is looking for a sincere and knowledgeable guide for the Auckland and the surrounding areas. Doug is fantastic we had a great time with him. He is flexible and knowledgeable. Doug's tour was excellent. He was very prepared for the tour and his information about the country and area made it a very enjoyable day. He went out of his way to make it great. One of our best tours ever. Fantastic guide and fantastic tour. Superb guide with incredible knowledge base of this area as well as history and culture. He also kept the tour moving and got us to sites before big tours and at exact times to see as much as possible. Also made suggestions and tour flexibility with inclement weather. The Maori cultural center was fabulous and who knew that you could make kiwi fruit interesting. The only thing that we would add is that there needed to be more clarification of additional costs of admissions above basic tour cost. Doug laid out a terrific itinerary for our group of 8. He did a good job of being able to accomodate the various interests of the members of our group. Even though it seemed like a simple tour stop, his knowledge of the Kiwi industry and the Kiwi plantation tour was fascinating. The trip to the Maori village was a treat. All in all, the day we spent with Doug was full of interesting, informative sites and very satisfying. My family (15) traveled for two weeks, in a cruise, around New Zealand, and in every stop we did a tour, by far my family's favorite tour was the one we took in Tauranga with Doug. He made the most out of our day that started at 7:45 AM and finished at 5:00 PM, we did a walk in a forest, where we stop at a waterfall, we feed some ducks, had a private tour in Hobbiton, had an awesome picnic and went to see "Te puia" geysers. It was a very friendly tour for the toddlers and Doug was the best tour guide. Doug was wonderful, very flexible & knwlegeble. Although we didn't get the full sight seeing due to our short comings, Doug tried to give the most we can get in Auckland. He was excellent in Taranga especially the 4 in 1 day tour. Awesome. I will ask for him again. This tour (4 in 1 day)was the most interesting & educational. The whole family was very impressed.. It's awesome & Doug was full of knowledge. He's the best. 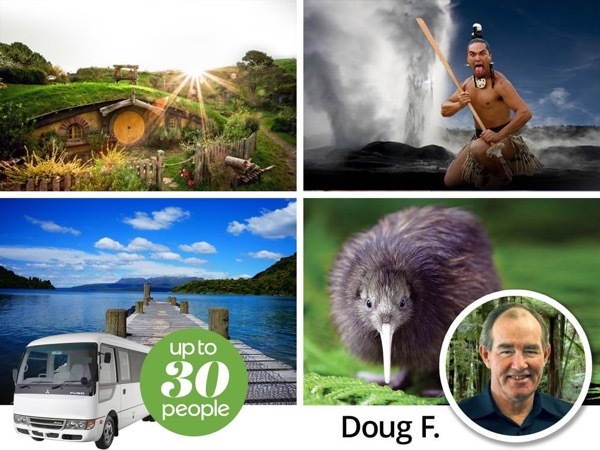 Doug F. is truly passionate about all aspects of New Zealand. He shared his insights and history of the Maori people, the land, and the products developed in New Zealand. It was a one of a kind adventure. 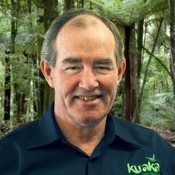 He is the person you should select as your tour guide if you are visiting the Rotorua area. TOUR GUIDE RESPONSE: Thank you Patty, I enjoyed being with you and your family. Doug met 10 of us who were on a cruise to Rotorua. Doug's knowledge and experience were evident to us as customers and also the other guides and museum staff we encountered. It was clear that he is deservedly respected by his peers. We would highly recommend him. This was an absolutely fabulous tour. Doug provided so much background information. He was able to get us on the Hobbiton set before it was open for the day to the public. I limited the group to fifteen people which was a good number and everyone thought it was wonderful. We did this as a private tour from a cruise ship when we docked in Tauranga. We thoroughly enjoyed our day with Doug. He is a wealth of knowledge on New Zealand and was an excellent guide. The highlight for us was the tour through Hobbiton. The site was absolutely stunning and exceeded our expectations. We also enjoyed the Glowworm cave and the walk through the rain forest. It was a great day and we appreciate Doug making it a wonderful experience for us. The tour was excellent! Doug proved to be a very knowledgeable and very easy going person, he was flexible to accommodate all our requests within a very tight schedule. I will definitely recommend Doug and this tour! Our trip, being business in nature, was nothing short of amazing. Doug has managed to line up the tours and key stop points for our video shoots in such a grace that we were always on time and on budget. He is very professional about all the details and has connection to a lot of key figures around the country that made our job a lot easier. Definitely will work again. Doug was absolutely the best tour guide ever! Doug was so knowledgeable about New Zealand and clearly had tailored the tour to our interests. His passion and zeal for the intricacies of Maori culture, the rainforest, the farmlands, and the history of his country was contagious. We learned more about this amazing country from our time with Doug than we have from all other tours combined. Our only regret is that we had to get back on our cruise in Tauranga. Thanks for making our trip so special, Doug. Doug is one of the most knowledgable guides we have ever had. His life experiences bring great meaning to what we saw. Doug was accomodating to what we wanted to do. He had more information than we could imagine. We went on side walks and trips which were unexpected and fun. I cannot immagine a better guide for Rotorua. Thanks Doug. TOUR GUIDE RESPONSE: Hi Kathleen Thank you very much for the feedback! I was not looking through the site so missed that you had done this. It was fun to take you down to that rushing river! It is such a surprise. Please give my regards to the others. Also I do run multi-day tours with small groups around quite a bit of New Zealand so if you or some of your friends are thinking of coming, please call me. Outstanding guide! Delightfully informative & accommodating. Listened & understood what we interested us. Painted a picture of the Maori-NZ way that made me want to live here: the drive for consensus, a healthy environment, sustainability, and creativity. Showed us how these attributes led to successful outcomes, like the kiwi fruit program. As my hypercritical brother said, we would never have known or appreciated what we were seeing if not for Doug. He made our trip enjoyable beyond the ordinary. Doug was an excellent guide - great knowledge of the area & NZ history. We all had a great day and would highly recommend Doug to any fellow travellers 5 star guide!!!!! By far the most knowledgable tour guide we have epver had. His breadth of knowledge off Maori culture, geology, and all things New Zealand will giive you an insight into New Zealand I can't imagine could be replicated without taking an intense survey course. Doug is also personable and sincerely wants you to experience beautiful and meaningful sites. Doug provided us with a wonderful private tour of the area during our cruise ship stop in Tauranga. Doug is very knowledgable, pleasant, and was very willing to accomodate the needs of our group. Thanks again Doug! In a word, fantastic! Doug's intimate knowledge of all that he showed us was a gift for us, we thoroughly enjoyed every minute of this tour! highly recommend him and his tour! We thoroughly enjoyed our tour to Rotorua with Doug. He is so knowledgeable about the area, and really gave us a complete understanding about the geography and conservation issues which they are trying to address. The visit to the Te Puia and learning about Maori culture was fascinating. Doug was very accommodating and offered options a little off of the beaten path. The Luge was great fun as well! Thanks!